HOME | CONTACT | JOIN | CHAT NOW! 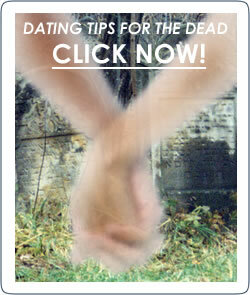 There are many ways to get in contact with us here at GhostSingles.com. Use the one that is easiest for you. Phone: Let it dial itself. Psychic/Medium: We're somebody who you never knew in life. Perhaps? Maybe starts with an S? Okay, how about G? G, okay, and you want to tell us something. No, you want us to tell you something? Oh, okay, both. Let's... hmm. Maybe email would be faster.